Kevin Higgins completed his fifth season on the Wake Forest football staff, in 2018, and helped the Deamon Deacons to their second consecutive bowl game invitation. Higgins, who spent nine seasons as the head coach of The Citadel, serves as the assistant head coach, recruiting coordinator and the coach of Wake Forest’s wide receivers. 2018 saw Wake Forest earn a bowl bid to the Birmingham Bowl vs Memphis. Higgins was instrumental in the continued devlopment of WR Greg Dortch, who had 89 catches for 1,078 yards and 8 TD on the season. With 8 wins in 2017, it became only the 2nd time since 1940 that a Demon Deacon team has had at least 7 wins in at least two consecutive seasons, while earning a berth in the Belk Bowl. Higgins coached Freshman All-American WR, Greg Dortch, who had 722 yards receiving with 9 TD. “Kevin has a wealth of football knowledge gained as a head coach and also through his experience in the NFL as a quarterbacks and wide receivers coach. He has been a great addition to our staff,” said head coach Dave Clawson. In his four seasons at Wake Forest, Higgins has helped two of his proteges earn spots in NFL training camps. Matt James was with the New Orleans Saints in 2015 and K.J. Brent has earned a spot with the Oakland Raiders in 2016. In 2015, Higgins mentored a young group of receivers into a cohesive unit. Wake Forest’s freshmen accounted for 131 receptions, tied for the national high during the regular season. True freshmen Chuck Wade and Tabari Hines each broke the school record for receptions by a true freshman. Higgins completed his ninth year as the head coach at The Citadel in 2013. He lead the Bulldogs to a 7-4 record in 2012 for the program’s first winning season since 2007. Higgins was the 23rd head coach in school history and ranks third all-time in wins at The Citadel. Among The Citadel’s wins in 2012 were victories over Georgia Southern and Appalachian State, which were both ranked in the Top 10 in the nation at the time. The dramatic 23-21 win over the No. 3 Eagles marked the highest-ranked team the Bulldogs have defeated since a win over No. 1 Marshall in 1988. The seven wins marked only the second time The Citadel has reached that plateau since 1992, with both coming under Higgins. The Bulldogs also had a 5-3 record in the Southern Conference, the most league wins since capturing the conference title in 1992. The Bulldogs spent four weeks in The Sports Network’s Top 25, reaching as high as No. 10 after the 52-28 win over Appalachian State on Sept. 15 to become the first Citadel team to crack the Top 10 since finishing the 1992 campaign ranked first in the country. As a result of The Citadel’s success in 2012, Higgins was named the SoCon Coach of the Year, becoming the first Bulldog mentor so honored since Charlie Taaffe in 1990. Higgins finished the 2013 season with a record of 43-58 at The Citadel and 99-83-1 in 16 seasons overall. In 2011, The Citadel posted a record of 4-7 with five of its losses coming by 10 points or fewer. In their second season in the triple option offense, the Bulldogs ranked third in the nation with an average of 286.6 rushing yards per game while the defense allowed averages of only 23.4 points and 343.8 total yards to rank second and third, respectively, in the Southern Conference. Higgins arrived at The Citadel in 2005 and immediately made his impact on the program. In his second season the Bulldogs won three of their final four SoCon games, including a victory over Georgia Southern, to finish 4-3 in the league. The 2007 campaign turned out to be the finest season enjoyed by The Citadel since winning the SoCon title in 1992. The Bulldogs posted a record of 7-4, their first winning season in 10 years, and tied for third in the SoCon with their second straight 4-3 conference mark. The Citadel finished fourth in the nation with an average of 39.5 points per game and led the SoCon by allowing only 356.5 yards a contest. Prior to his appointment at The Citadel, Higgins spent the 2001-04 seasons with the Lions, serving as the quarterbacks coach for his first three years before switching to the wide receivers in his final campaign in Detroit. During that 2004 season he was responsible for the development of one of the most exciting trios of wideouts in the NFL – Az-Zahir Hakim, Charles Rogers and Roy Williams – with Williams setting team rookie records for receptions, receiving yards and touchdowns in a season. 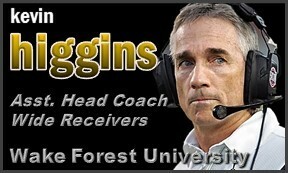 Before joining the NFL ranks, Higgins was one of the hottest coaches in FCS football at Lehigh, leading the Mountain Hawks to three straight Patriot League championships and NCAA playoff appearances from 1998 to 2000. Lehigh lost only one regular season game in his final three seasons and posted an overall record of 34-4 during that span. Higgins had an overall record of 56-25-1 in seven seasons at Lehigh, winning four conference titles and earned Patriot League Coach of the Year honors in 1995, 1998 and 2000. In 1999 and 2000 he was a candidate for the Eddie Robinson National Coach of the Year Award. The Mountain Hawks won two NCAA playoff games under Higgins, defeating Richmond in 1998 before losing to eventual national champion Massachusetts. Two years later Lehigh had its second undefeated regular season in three years and knocked off Western Illinois in the opening round of the playoffs. Three of Higgins’ Lehigh players – Rabih Abdullah, Rich Owens and Phil Stambaugh – played in the NFL. Higgins spent a total of 13 seasons at Lehigh, the first six (1988-93) as an assistant coach before his promotion to head coach in 1994. Higgins began his coaching career on the high school level before spending the 1981-84 seasons at Gettysburg College and the 1985-87 campaigns as an assistant at Richmond. A 1977 graduate of West Chester, Higgins earned a bachelor’s degree in health and physical education while playing free safety and being named the team’s most valuable defensive back his senior season. He went on to receive his master’s degree in physical education from East Stroudsburg in 1981. Higgins and his wife, Kay, have three children – son Tim and daughters Meaghan and Katie Rose.